I don't have much experience at cooking seafood, but i sure love to eat it!!! 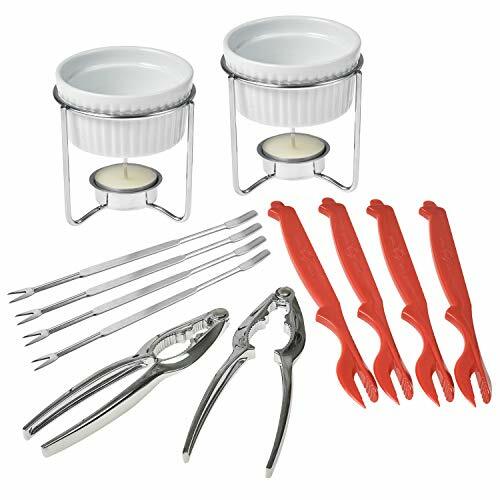 I need advice on kitchen gadgets, cooking utensils, serving items... all the things needed for cooking a seafood feast! This is an amazing set for a lobster meal. The butter warmers add a real touch of class to the meal. These scissors are great not just for seafood but also for general use around the kitchen. We always cook all of the classics. I want cook books with really unique recipes that are still sort of in the thanksgiving genre, but unique. Also neat serving trays with flair, other really rad stuff like table decor and any other ideas to stand out this holiday. What can I buy for my kids teachers? What are good gifts for my children's teachers for Christmas? Im thinking, small yet thoughtful gifts in the $15 or less price range. I usually give my mailman a Christmas card with $30, but that seems impersonal. I need gift ideas that are more thoughtful in that price range.